Although I did try to be intentional about updating my blog with my experiences in Uganda as I experienced them in 2009, Rwanda was a completely different ball game. In April of 2009, van loads of American students journeyed for 13 hours on red, pothole-filled roads to the capital city of Kigali for a week of what could only be described as emotionally exhausting, haunting and life-changing. We arrived in Kigali with the knowledge of the 1994 genocide, but nothing could have prepared us for the firsthand testimonies from Rwandan peers who watched as their parents were slashed to death before their eyes. Nothing could have prepared us for images of innocent babies murdered in their mothers' arms. Nothing could have prepared us for the facts that as beautiful, innocent Rwandan men, women and children were brutally killed, the world stood by and did nothing. How do you write about that? How do you take pictures? You don't. And so I didn't. The picture below was taken by classmates during a less intense moment. The words were my reflections. Over three years later, I'm ready to share my experience in Rwanda. So much of our time in Rwanda has been dominated by horrific stories of the evil of mankind and the saddest and most heartbreaking testimonies. However, I wouldn't describe these things as the overarching themes of the trip. When we did our group Church visits, I shared a testimony that I had really struggled in trying to fathom what happened and why it happened 15 years ago. God immediately answered my prayer and revealed to me the Holy Spirit working through so many Rwandans in the forms of perseverance, joy, faith, but most of all- hope and forgiveness. Those two things are how I describe the theme of our Rwanda trip. To provide some background, I should probably say that about 5 years ago my mom, sister and I escaped the home of my mom's second husband. Perhaps it would be more appropriate to say we were rescued from his alcoholism, as well as his verbal, physical and sexual abuse. Since then, I have tried and failed multiple times to forgive him for what he did to the three of us. If anything about this trip has allowed me a profound revelation, it was hearing the testimonies of the genocide survivors; in particular, that of Olivia* at the Christian Hope Village. So many victims of the genocide have remained so strongly rooted and steadfast in their faith under seemingly impossible circumstances; but what impacted me the most was that the same people who lost absolutely everything during the genocide were able to forgive the people who took it all away. If these amazing and faithful survivors can forgive the people who killed their fathers, raped their mothers and altogether destroyed their lives, what puts me in the position to refuse forgiveness for something so small? Especially in light of everything I still have and how blessed my life is. My immediate goal is to make a conscious effort to forgive Adam* and also to stop being so doubtful and wishy-washy in my faith. Hearing the stories of these inspiring people has really made me take a step back and evaluate my faith, my heart and my character. My hope is that in the long term, I'll be able to look back on my time in Rwanda and remember the incredible people I met here when I need a reality check in my Christian walk. Another small thing I've experienced was the hatred and anger I felt toward the West in 1994. I immediately realized, however, that those same feelings of hatred were what burned in the hearts of the Hutus during the genocide. It truly made me realize the importance of kindness, and "loving your neighbor" because I've witnessed firsthand the consequences when we forget Jesus' message. These observations have made me aware of how much I need to change about myself and I don't believe this will be part of a "Jesus high," but something I'll be able to stick to. These were the words I wrote in response to my week in Rwanda in May 2009. Reading them now fills me with the same agonizing heartbreak and conviction I felt at the time and has encouraged me to perhaps continue on with a Rwanda: Part Two in the future. Let us never forget how blessed we are and let us never cease praying for those who need it most. Powerful post, love your blog! Ouf. Yea. I can just imagine how hard all this was, IS, for you. It takes a lot of courage to go to Rwanda and experience face to face the lives of the surviving victims. I think it's beautiful that something so awful, can be transformed into a lesson for you (and others). 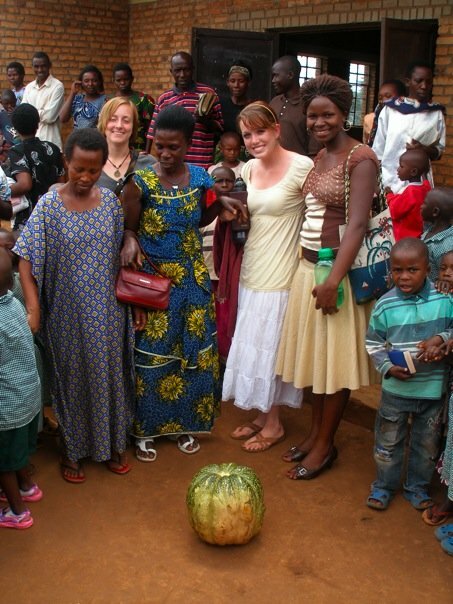 One of my best friends (also bridesmaid in my wedding) was working in Rwanda for 6 months in 2006-2007. She came back changed. I also met a wonderful young lady a few years ago, who would become my son's evening sitter while I went to my university classes. As we got closer, she told me about her experience in Rwanda losing her father and other members of her family.